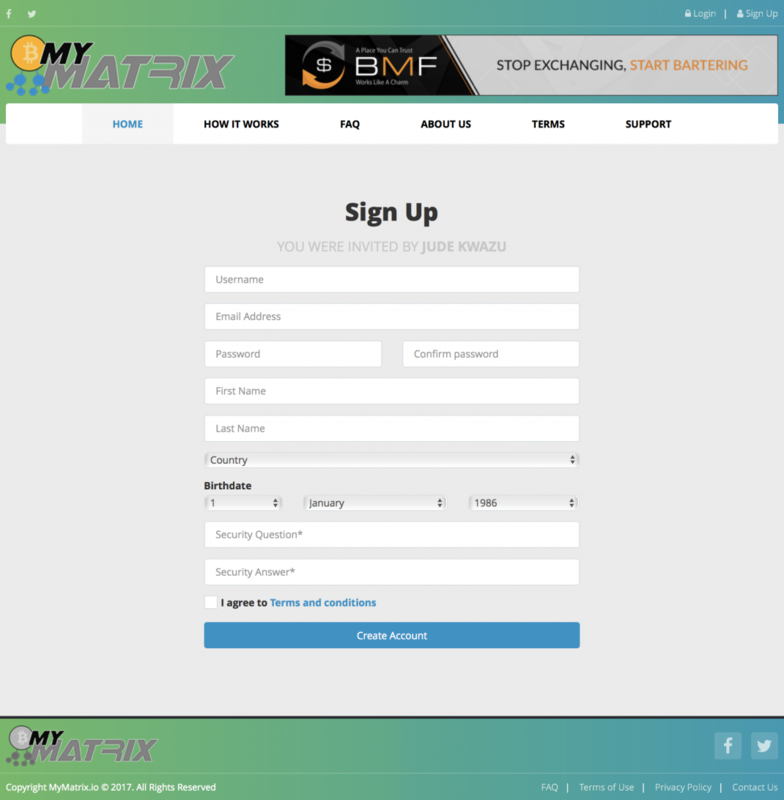 MyMatrix.io, the biggest, best built member to member matrix. A fair member to member matrix, with a bonus structure to reward those that don't make a monetary profit. This time backed up by flawless code which is able to survive any level of pressure. Considering that the first attempt of launching the project was met with great enthusiasm without having a lot of time to do proper marketing, we would say the success rate of this project is extremely high. There should be statistic showing in header total members and total donations (same as on homepage), then user profile - join date, last login date, avatar, amount/value of donations sent/received. Additionally summary of user's ref network is required. There should be ability to manage BTC wallet (add/edit). The most important option is to Upgrade the account. By default each account is created for 48h (configurable), then is removed from system, unless user will donate his upline on time. User needs to know his upline BTC address, makes a donation, then provides transaction id for verification. Script verifies if amount and recipient account are correct. Matrix size should be configurable from admin panel. If your upline has enough users referred, then newly registered user is placed at first possible spot in the tree of original referrer. There should be 2 algorithms for assigning to choose: left to right or weakest leg. Users can only donate upgraded uplines. User on Level 1 sends donation to level 1 upline and receives donations from downlines on level 1. User on Level 2 sends donation to level 2 upline and receives donations from downlines on level 2. 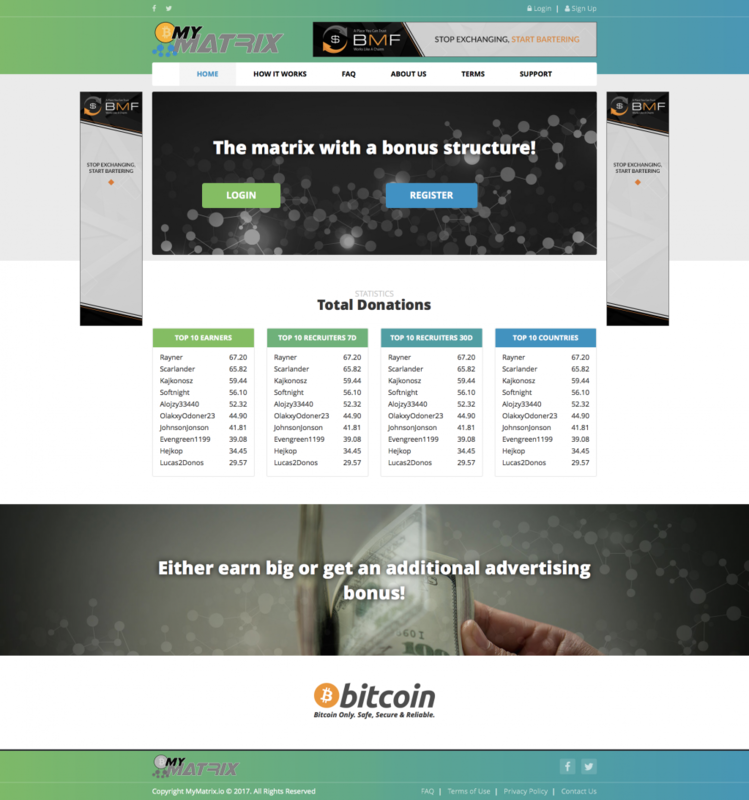 In matrix width 2, you need to activate your account by donating an upline with 0.027 BTC. On the first level you can receive 2 donations of 0.027 BTC from non-active downlines and you send 0.045 BTC to upline to gain level 2. Second level upgrade allows to receive 4 donations of 0.045 BTC from level 1 downlines and requires to donate 0.09 BTC to level 3 upline. On third level you can receive 0.09 BTC from 8 downlines on level 2, but need to donate 0.18 BTC to get to level 4. On level 4 you can receive 0.18 BTC from 16 downlines on level 3, you need to donate 0.9 BTC to upline on level 5. On level 5 you can receive 0.9 BTC from 32 downlines on level 4, you need to donate 1.8 BTC to upline on level 6. On level 6 you can receive 1.8 BTC from 64 downlines. To keep your upgrades active and be able to receive donations in the following month, you need to pay subscription for each upgrade once per 30 days. System needs to manage all users properly. Inactive accounts to delete cause a need to rebuild the tree in a fair way. It also should prevent the situation, where one user has more downlines than width of the matrix is. For each donation user receives ad points (amount configurable). You can also see list of pending, completed and missed donations. Show ref network graph - usernames, emails, account levels, expiration date. Allow to edit profile fields (configurable from admin panel), avatar, option to lock ip address - prevent login from a different IP, list of last different IP addresses, add social links, control information shared with others: email, avatar, social links, skype, phone etc. Give users an option to buy ads on Hompage. Everything should be configurable from admin panel: which ad spots should be available for purchase using points and which for BTC, price - per day or per hour. User has to create campaign first (select ad spot, upload banner, link), it needs to be approved by admin, then he can make a purchase by selecting available date/time from list, created ad and payment method. Show details of purchases on another subpage. List of reviews, option to add yours, each review needs to be approved by admin. Link to external support system? Show some stats there, like amount of signups, upgrades, users on each level, total donations. Below show pending things to be approved: testimonials, ads. Send emails to user groups or all users, WYSIWYG editor, use external api to send. 3.6.5. Registration: Activation Email, ReCaptcha, Fields to choose: Country, First/last name, Address, Phone etc. Getting repaid with company stock instead of cash.